Pan! 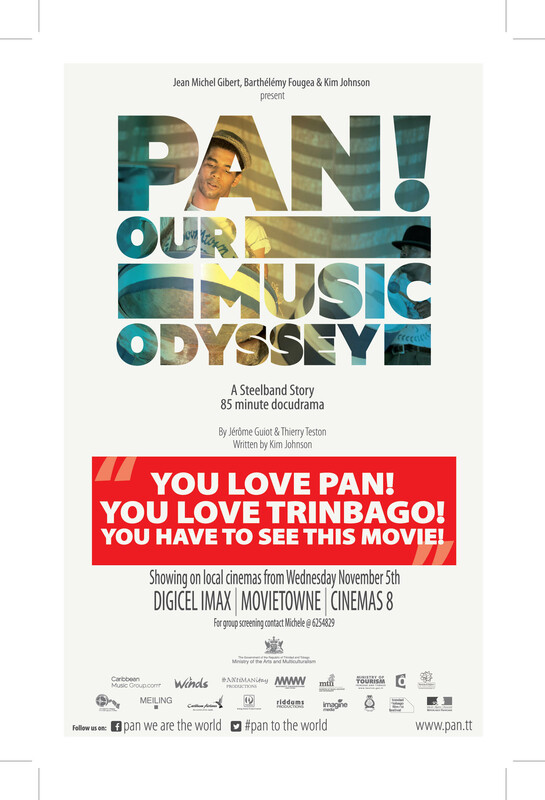 Our Music Odyssey brings together in docu-drama form, a fictional account of the birth of the steelpan seventy years ago, with a present day story of how musicians come from all over the world to participate in the annual Panorama competition in Trinidad. Starring on screen are some of T&T’s best known actors: Che Rodriguez, Penelope Spencer, Conrad Parris and Errol Fabien. The film’s hero is ‘Goldteeth’, played by emerging young talent Renaldo Frederick. The film also features some of the leaders of the steelpan movement at home and abroad, including Len Boogsie Sharpe and Phase II Pan Groove, Andy Narell and Birdsong, Trinidad All Stars, Desperadoes and some of the players and musicians who come from all over the world to experience our national instrument. Pan! Our Music Odyssey, written by pan researcher Dr. Kim Johnson, tells a classic adventure story of the young people who were involved in the creation of the national instrument. It was filmed entirely in Trinidad and features a cast and crew of over 300 nationals. Costumes were designed by the doyenne of local fashion Meiling and her team led by Shannon Alonzo. The use of high production values to showcase our many talents makes this film an important and culturally relevant tool to introduce another generation to the amazing story of the steelpan. Pan! Our Music Odyssey is a timely intervention to show that even in the face of adversity, our young people are capable of creating an instrument that can, seventy years later, have a huge and positive impact on the world.